How to use AutoComplete control for foreignKey column? This Knowledge Base explains the way to place the AutoComplete control for the Foreign Key column using the Edit Template feature of the Grid. 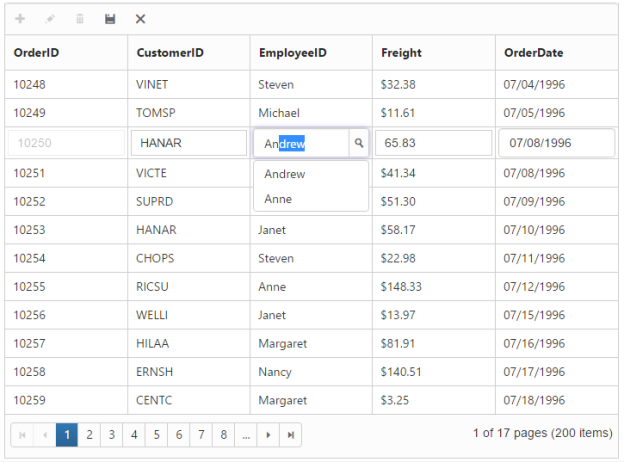 Render the Grid with the foreign key column and define the editTemplate with read, write and create events. In the write event of the editTemplate, render the AutoComplete control with the necessary properties and bind the datasource from the respective foreign key column. Please make a note that the read event’s return is different for batch edit mode when comparing to the other edit modes such as normal, dialog, external forms and inline forms (applicable to respective template mode also).